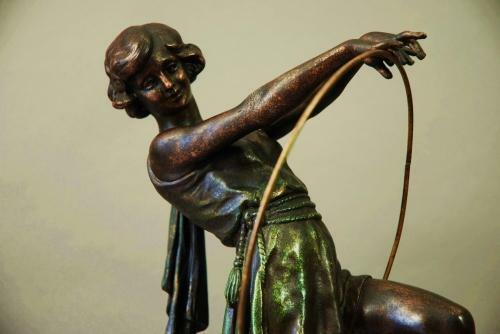 An early 20thc French Art Deco spelter figure of a girl holding a hoop. She is standing elegantly on one leg on a pink marble base terminating on four gilt feet. This piece is not signed but has a Paris Salon stamp which can be seen in photograph 4. She is wearing a green dress with a swag style belt.